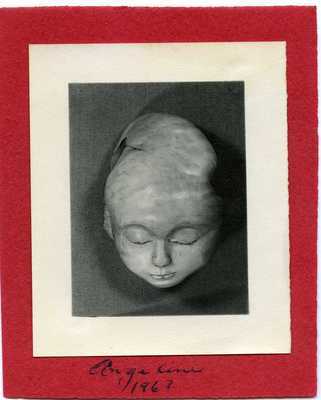 "Photograph of a Wooden Sculpture, "Angeline" "
Photograph of a Wooden Sculpture, "Angeline"
A black and white photograph of a sculpture of a woman's head and face, labeled "Angeline." The wood sculpture was created by Margo Holden, and the photograph used to create a small card that reads on the back, "Merry Xmas to Mr. Soule from Carl and Margo." In the Margo Holden portion of the Harris W. Soule papers.